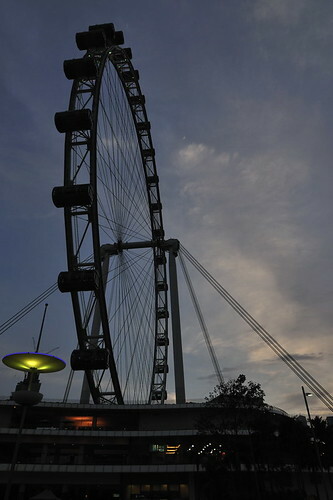 Every time you speed across Benjamin Sheares Bridge, you should be able to see this gigantic ferris wheel called the Singapore Flyer. 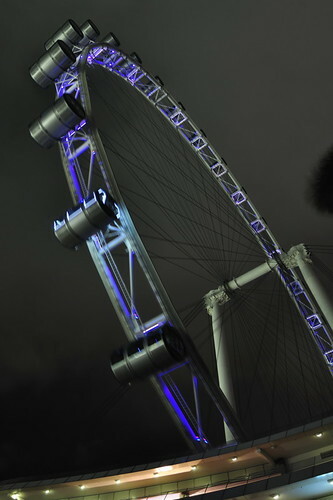 At 165 metres tall, it is currently the tallest ferris wheel in the world. Personally I have not experienced what it is like inside one of the capsules, and today marks the first time that I stand right on the grounds of this gigantic structure. I treat this as a recce trip, where I scout out the entire area, and familiarize myself with the place. I was trying to find good spots and angles to take some pictures, craning my neck looking up into the skies. A man from the management office was taking some pictures and actually told me that they were planning a new lighting for the capsules. See that particular capsule that is lighted up? That was the experiment they were doing to see how it looks. The man asked if I could send him my photos with the special lighting, and I willingly agreed. But he forgot to pass me his email address and contact number… oh well… I don’t even know your name mister! Oooo … I like the third photo the most! Because the Flyer moves, I don’t think it is good to have long exposure unless u wanna do some really cool motion blur effect. I would raise the ISO a bit to get a faster shutter speed. Wilfrid, actually I prefer to show motion. And because the lights on the Flyer may not all light up at the same time, a quick shutter may not show the entire ring being lighted, as what you see here. Anyway I hate to have unnecessary noise for night shots due to the background being dark.